Two years ago, my friend Kyle Hamilton and I set off to make a skate video to commemorate his time in Los Angeles, before moving to the more compressed big city of New York. After day one of shooting left us so sore that day two quickly became a wash, we discovered the title for our movie: "Too Old for This." That was two years ago, and I'm still skating, so I guess I wasn't too old for it. But then last weekend I found myself injured in a (two-hand touch) football game that nearly jeopardized an excellent South swell the next day. And so I have to ask myself again, am I too old to keep doing these extreme sports? 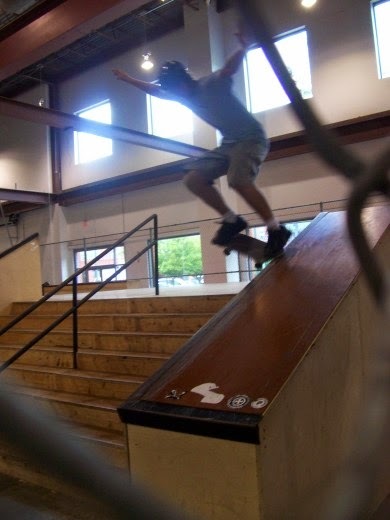 This was taken just before the peak of my skating "career." The answer is a resounding NO! And neither are you. The fact of the matter is, though age deters progress, it only increases your ability to have fun. Case and point: at the peak of my skating, I had dreams of sponsorship, traveling the country (dare I say it: the world?) with a team, exploring new spots and making amazing videos that pushed the limits of the sport. Every venture to the skatepark was a new opportunity to hone my skills, and if there was a sponsored skater at that park, to impress him into inviting me to be on his team. As a result, each session was about landing the trick, looking good doing it and capturing it on video, no matter how many attempts it took. Sure, I had fun, but there were moments when I was in the midst of skating greatness and found myself figuratively paralyzed for fear of inadequacy, or forcing my friends to watch me try a trick 75 times to get it on tape. Now, in my "old age," those thoughts and ambitions have long since sailed away on a sea of reality and full-time jobs, resulting in the unthinkable notion and freedom of simply having fun skating! Many a times I have drifted to an empty corner of the skatepark to try my measly backside air (featured in this video) or a kickflip down a 5-set. Sooner or later a "good" skater would show up, drawing a crowd as he goes for a nollie body jar 5-feet out of the pool, or a 360 heelflip down the stairs. And did I quit? No sir! And when I landed it, though no one else was impressed at my skills compared to the whipper-snappers around me, I knew that I had accomplished more than just landing a trick...I had fun doing it. And so I charge you, old man, stop browsing the internet, buy that rack already and go do what you love! You can thank me later while you're icing your knees.